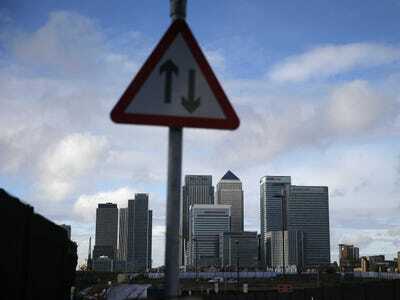 REUTERS/Suzanne PlunkettA view of London’s financial district. Since the 2008 financial crisis, Britain’s banking sector has struggled to recapture its pre-crisis dynamism. A combination of new regulations to force banks to hold more capital in case of future shocks, increased oversight of pay and practises, and less risky loans on the balance sheets of large banks has prevented the sector from a return to the halcyon days of the mid-2000s. 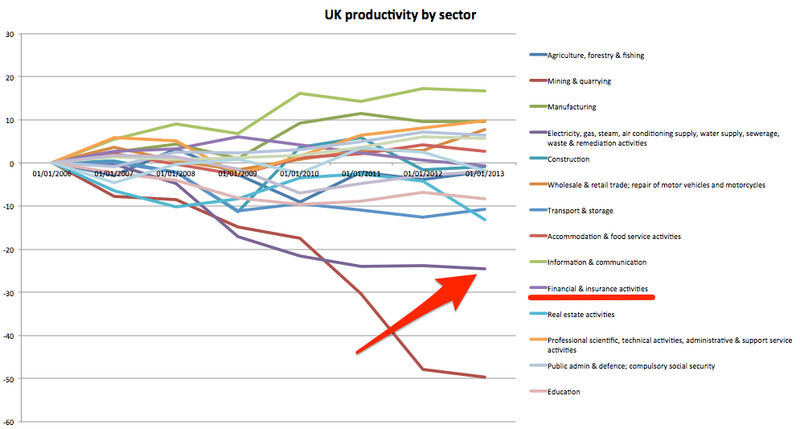 The question now is, are the sector’s current struggles a temporary blip or something more permanent? Since the crisis, the UK has seen a significant recovery in its labour market and, more recently, a recovery in economic growth after years of sluggish performance. 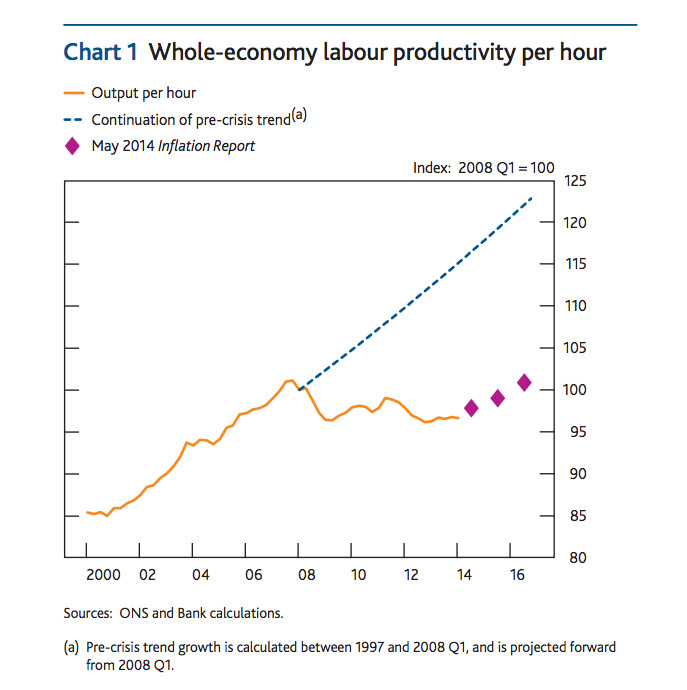 But labour productivity, measured as the amount of goods or services produced in a single hour of work, has failed to track these improvements. 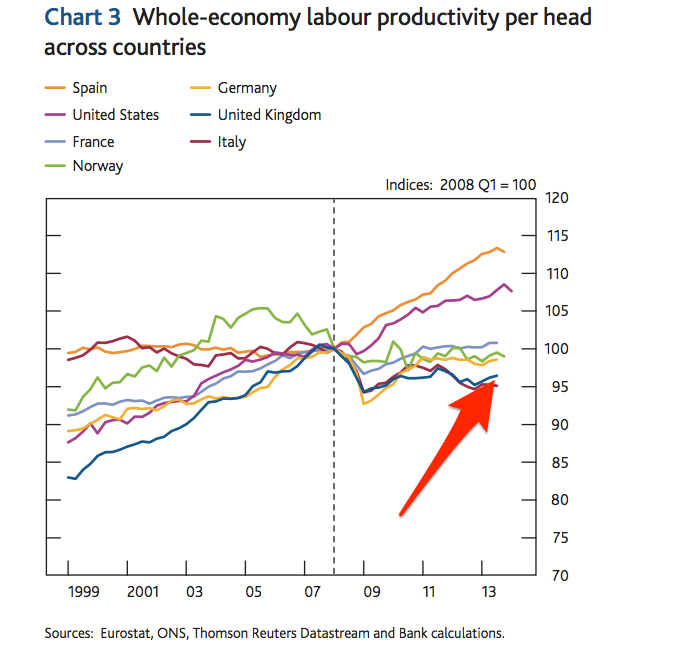 Why does productivity matter? 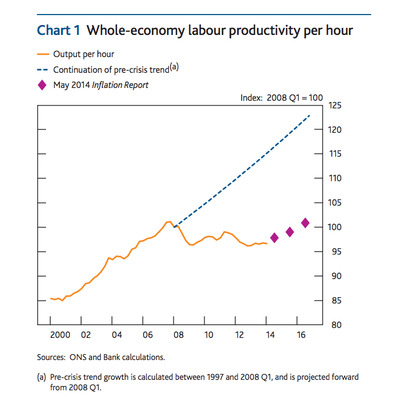 Increases in productivity mean that employees produce more goods and services in the same number of hours worked. This means that additional demand for those goods and services can be met without necessarily increasing prices. Without it, price inflation is likely to kick in at a higher level of unemployment than you would expect with some productivity growth as more people enter the work force and have more money to spend. This would force inflation-targeting central banks to raise rates earlier, effectively locking in that higher level of unemployment and reducing the potential of the economy. 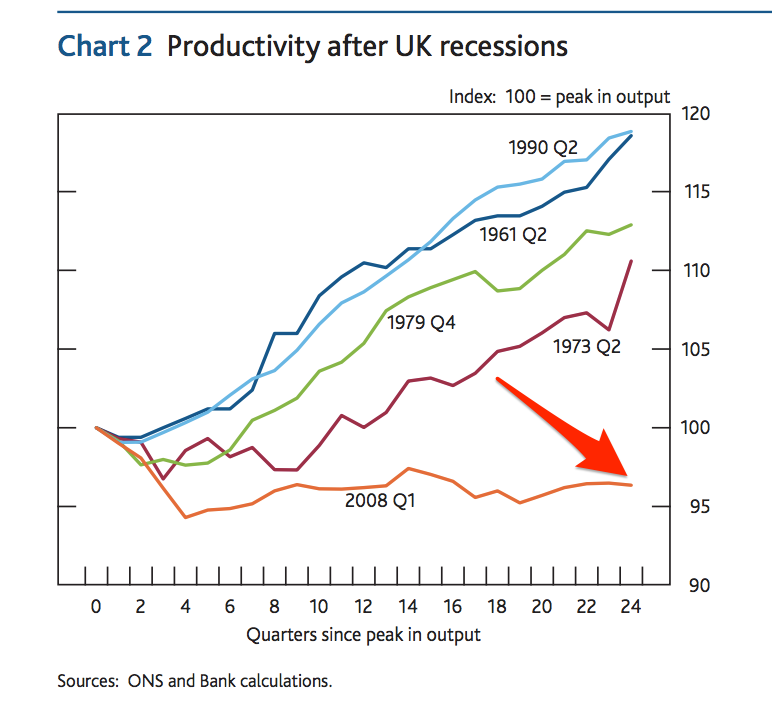 More than six years since the onset of the financial crisis and the UK is still waiting on signs of a pick-up in productivity, and it has left even the most optimistic of economic observers nervous that the UK has suffered permanent damage. 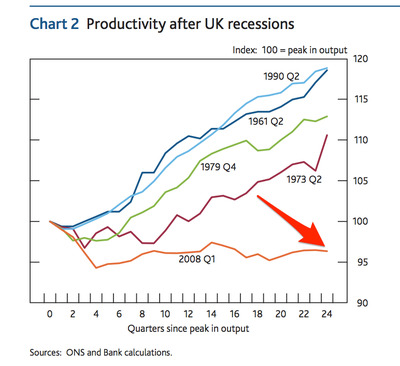 And this is why they’re worried — one of the key drivers of pre-crisis productivity growth was the financial sector and, as described above, it seems to have stalled. 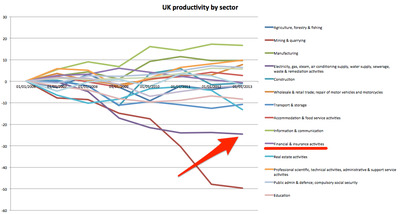 The concern is that much of this productivity loss reflects permanent damage to one of Britain’s most successful sectors rather than a temporary hit from the crisis. In a speech on Nov. 18 Kristen Forbes, a member of the Bank of England’s rate setting Monetary Policy Committee, suggested just such a worrying possibility. Forbes suggests that this is the result of the “deglobalization” of finance, meaning there is less money moving between countries. Cross-border capital flows have fallen sharply since the crisis and shows little signs of recovering. “International capital inflows are now only 1.6% of globalGDP, ten times less than the peak of 16% in 2007,” she says. 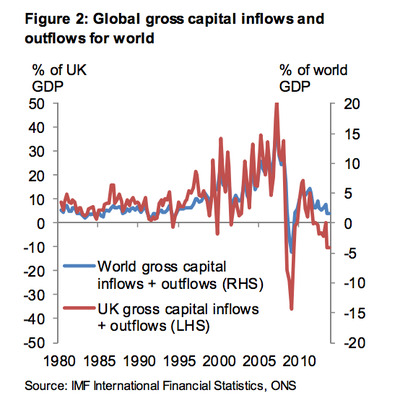 Forthe UK, the situation is even more stark with capital inflows equalling 50% of GDP at peak before plunging during the crisis. 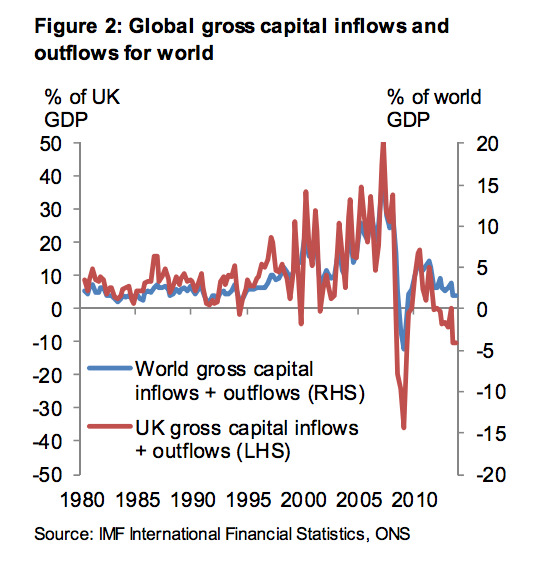 Most worryingly, over the last few years of the UK’s “recovery” capital flows have failed to keep pace. 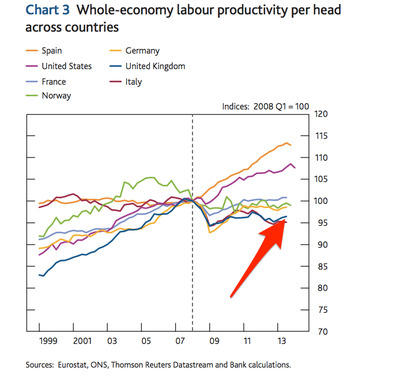 If this thesis is correct, one possible explanation is that lower output from financial sector workers is being caused by the declining importance of UK banks to the international financial system. She suggests this could be due to an increasing “home bias” of large financial institutions reflecting a combination of more rigorous regulatory regimes and enforcement, increased costs of overseas business and falling loan demand. In other words, the drop in cross-border flows could be a permanent feature of the post-crisis world — and with it any hope of a recovery in financial sector productivity. Of course, there’s also a problem with this theory. The amount of money flowing around the international financial system prior to the financial crisis was one of the reasons why the fire that started in the US housing market eventually engulfed the global economy. Recovering and rebuilding from that was always going to be a gradual process as the unwise debt built up over those years is gradually unwound and economies re-orientate themselves away from damaged sectors like sub-prime housing towards more productive activities. It is, at this stage, impossible to tell whether we are seeing a process of global deleveraging that will eventually give way to a recovery, or if this really is the new normal. Depending on which you believe to be the most likely, the implications for policy are vastly different. If you accept Forbes’s argument then the UK needs to accept that it has taken a permanent hit from the financial crisis. Interest rates will have to rise sooner than the Bank of England currently expects, the UK government will need to find new ways to finance its current account deficit and wages and growth will be significant lower in future than they would otherwise have been. However, if you think that these effects (or at least a substantial proportion of them) will prove transitory and the good old days will come roaring back then we need not panic, at least not yet.